Specifications: 1/8, 1/4, 3/8, 1/2 & ¾ pipe sizes, screwed end connections.Pipe threads as per BSPTr IS-554 of 1964.BSP 7 NPT threads global. Maximum Pressure: 10.5 kg/cm(150 PSIG) at 48C ambient.For Polycarbonate transparent bowls: 28 kg/cm2 (250 PSIG) at 90oC ambient for metal bowls. Techno Drive Engineering Pvt. Ltd. Port Size (BSP Thread) : 1/4", 3/8", 1/2", 3/4" & 1"
Size: 1/4 ",1/2 ",1 "
Riding on unfathomable volumes of industrial expertise, we are providing a broad array of Pneumatics FRL Unit. - Model nos: (1) KC - 01 - 1/8", (2) KC - 02 - 1/4"
We are engaged in the manufacturing and supplying Type FRL Unitsthat are manufactured using high quality raw material and cutting-edge technology. Compactly designed, these units are the consequence of advanced manufacturing concepts. 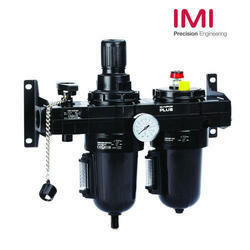 Moreover, these units are available in different specifications for various application areas. 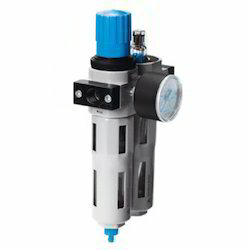 We are offering a comprehensive range of Pneumatic FRL units, which is widely appreciated for long lasting and quality attributes. These light and heavy-duty units can be used for the in various industries such as food processing, paper and packaging, pharmaceutical and textile. Offered at economical prices, our units are strong in design, construction and are resistant to rugged environment. With the support of professionals, we are offering FRL Unit to our clientele. These products are using the top quality raw material and advanced technology that gives us reliable performance. Our offered products are manufactured at industry norms and standards. In addition to this, offered products are checked by experts to keep the quality. Keeping in sync with time, we are able to offer an unparalleled range of FRL Unit. The offered range of FRL units is made utilizing optimum grade raw material and modern machinery in strict conformation with the industry laid standards. Along with this, the offered range is available in different customized specifications and forms in accordance with the diverse requirements of clients.